Helen and I went out yesterday with NUKB on a rideout around the Dales and past Tan Hill. I planned and led the rideout employing the re-grouping at every junction system, with LilMike doing a great job at TEC all day. 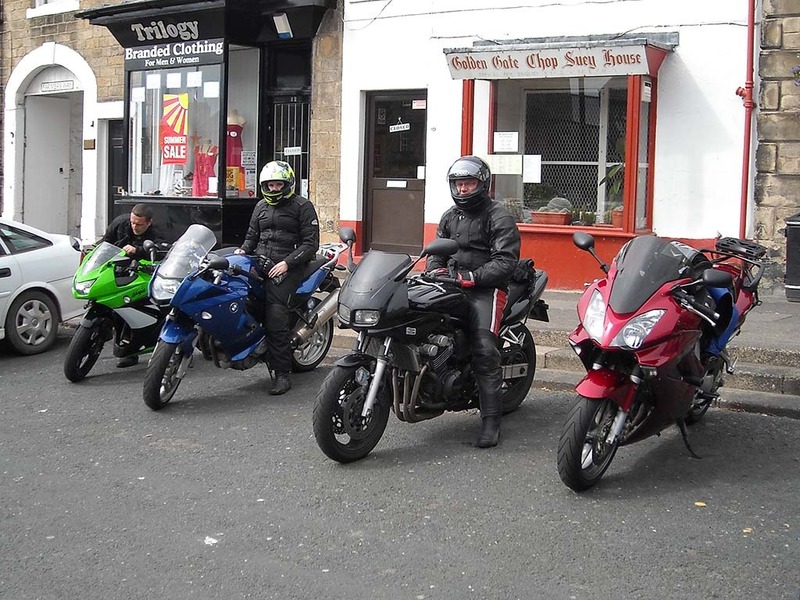 We all met up at Clitheroe Service at around 9:30am, there was only 4 of us in the end. We left Clitheroe on the A59 heading towards Skipton, we took our normal route to Settle, via Sawley and Wigglesworth. We then went to Hawes for a brew via Ribblehead Viaduct and the great B6479 and B6255. We arrived at Hawes at around 11:00am and un-expectantly found that it wasn’t that busy. We left Hawes on the A684 to Sedbergh and turned right at the Moorcock Inn onto the B6259 to Kirkby Stephen. We stopped at the Moorcock Inn to put on our waterproofs as the sky didn’t look to good. Sure enough on the way to Kirkby Stephen we encountered rain. We arrived in Kirkby Stephen to find dry weather and roads. We then went up to Brough on the A685 and then turned right onto the B6276, which is a fabulous often deserted road to Middleton-in-Teesdale. This road was also dry but we were riding in a fine mist of rain. Just before Middleon we turned right and cut across to the B6277 to Barnard Castle. We arrived in Barnard Castle for lunch at around 12:30pm. We left Barnard Castle at around 1:30pm and headed over the A66 and through Stang Forest. We then turned right and went over Arkengarthdale Moor and up to Tan Hill. On the way up Tan Hill a sheep tried to take me out, did miss it by much at all. At Tan Hill we turned left and headed down over Stonesdale Moor to the hairpins near Keld. We then went over Buttertubs Pass in the fog and arrived back in Hawes at around 2:30pm. We decided to carry on to Settle for a brew as it was raining now and retraced our previous route back to Settle via Ribblehead Viaduct. We left a dry Settle after a short brew stop and retraced our way back to Clitheroe via Wigglesworth and Sawley. On the way home we encountered some more heavy and persistent rain as we got nearer to Manchester. Raining in Manchester, never!! !